Our 18 month old baby E has been very picky at meal time lately. I was running out of steam on ideas about what and how to feed her. We were basically stuck with the same 10 to 15 meal variations and I just didn't have the time to look for new recipes between taking care of her, working, and cooking. Ironically it was the 'taking care of her' part that I overlooked. I was making food for her, but it became more like a chore that I didn't want to face most days. 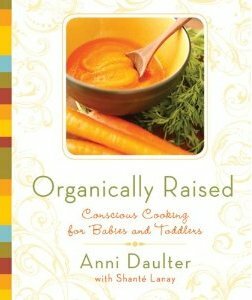 Thanks to Anni Daulter's book, Organically Raised: Conscious Cooking for Babies and Toddlers, I was able to find inspiration and the tools necessary to make feeding time joyful and enjoyable again! Not just for baby, but even myself. Thanks Anni! When I first opened the book, I was hooked. I couldn't put it down. It is very well organized, has just enough mouthwatering graphics, and it is inspiring to say the least. Not only does it offer a myriad of recipes, it also provides guidance and emotional support to instill the right mindset for creating meals for your children. A meal prepared with love truly is priceless! Ease of use: The book is organized into four parts. It leads you through the baby's first solid foods in the form of purees, then on to baby blends, all-season cereals, and yogurt recipes. The following Toddlers and Preschoolers section offers Cultural Cafe Recipes that are a little bit of everything to satisfy the toddler's taste for trying a variety of ingredients and textures. This is my favorite section of course because we have a toddler! It finishes off with sweet treats, definitely a lifesaver! Because these recipes are a healthy kind of sweet. We've been resorting to raisins and fruits, but there are so many new ideas I've been glad to find to add some variety to our desserts. In terms of physical ease of use, these recipes are just what a parent needs. We all know parents don't have time to make elaborate, time consuming meals. Organically Raised has just the right balance and the meals are very easy to prepare. We made Bodhi's Favorite English Broccoli-and-Cheese Quick Quiche this morning. It was a breeze! Such a perfect breakfast! Our new favorite for sure. I like that the preparation is rather short (took me about 15 minutes) and then you just toss it in the oven. I didn't have a pie crust so I just buttered a glass baking pan and poured it right in. It came out perfect and baby E loved it, not to mention my husband and I really enjoyed it as well! These recipes aren't just 'baby food', there is something everyone will love. Minor constructive feedback - it would be great if each recipe had the approximate amount of time it takes to make it at the top, in addition to serving size. Sometimes I don't have the time to read through the recipe to see if it's something I have time for at the moment. Other than that, I think this book is perfect! I have a feeling that in a couple of months I will know exactly how long each recipe takes because I can't wait to try them all! Value: It is priceless! Yes, you heard me. What this book did for our meal times truly has no price tag! But if you really want to know, the price is $21.99. Amazon has it on sale though for $14.95 and it is worth every penny. Who Would You Recommend this to? I highly recommend this cookbook to any parent who wants to feed his/her children wholesome organic meals that are nourishing, fun, and easy to make. 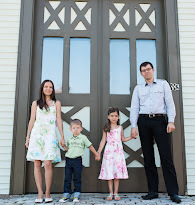 Buy: You can buy Organically Raised: Conscious Cooking for Babies and Toddlers at our [renovated] Eco-Babyz Boutique. One Eco-Babyz reader will win an Organically Raised cookbook! MANDATORY ENTRY: Visit the Organically Raised website and tell us which of the recipes featured you would like to try most. Contest ends at 11:59pm EST on Wednesday, August 18th. The winner will be selected using Random.org on Thursday, August 19th and notified by email (make sure I have a way to get in touch with you, provide email in your comment if it is not in your Blogger profile). Open to 18+ US residents! Thank you! Disclaimer:I did not receive payment in any form for this review.I did receive a sample of the product or service for testing and review purposes. This will in no way sway my opinion of the product or service. The review is in my own words and is my own opinion. Your results and opinion may differ. Zac’s mac ’n’ cheese twist sounds interesting! I voted on Top Mommy Blogs. I am all over baby story’s “green baby” green beans, broccoli, kale, and banana blend, since my little guy has started refusing everything green! I follow you by email, although I am not a new email sign-up. I think "bodhi’s favorite english broccoli and-cheese quick quiche" sounds yummy! I follow OrganicRaised on Twitter. I voted on Top Mommy Blogs today. I voted on WOTF today. I would like the try the sunshine’s chocolate tofu pops. #1 I subscribe to you via e-mail. #2 I subscribe to you via e-mail. brocolli and cheese quick quiche would be perfect for us! I would love to try the chocolate tofu pops! I've tried tofu ice cream before - these sound yummy too! I'd love to try the tofu pops. I'd like to try their mac 'n' cheese twist recipe. I would love to try the chocolate tofu pops! The zac's mac n cheese twist sounds good...maybe even mom would have a bite or two? Plus love all the vegan/veggie options! I'd like to try bodhi’s favorite english broccoli and-cheese quick quiche. I've never thought about adding a banana to greens for sweetness! Very clever. This sounds like my kind of book! I voted for you on We're on the Fence today. I would try the chocolate tofu pops. i would love to try the zac's mac and cheese twist recipe. i'm a fan of ecobabyz on facebook. voted for you on top mommy blogs. voted for you on top baby blogs. I like the Pure Carrot Puree! I like the zac’s mac ’n’ cheese twist. Looks and sounds yummy!